Blue/white: These lights have 6x 2835 SMD blue LEDs of 460-480 Nm and 18x 2835 SMD white LEDs of 7000 K. The colours blue and white can be dimmed independently of each other by means of the button at the rear of the lamp. This way, there is the option of, for instance, turning on a night light. The blue/white Nano aquarium LED lights have the same light output as one T5 fluorescent lamp with the same length. The RGB Nano aquarium LED lights produce approximately 75% of a T5 fluorescent lamp of the same length. It is possible to produce multiple Nano LED lamps next to each other. 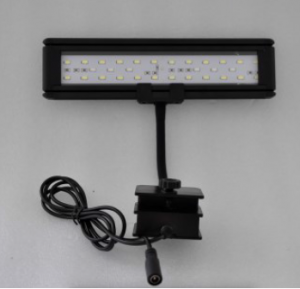 The Nano LED lights are available in one size: 26×6.5x1cm (LxWxH) and come with a mounting kit including 16 cm gooseneck, which can be used to place the lamp in the desired position above the aquarium. If you have any questions about this type of light. Please contact us.